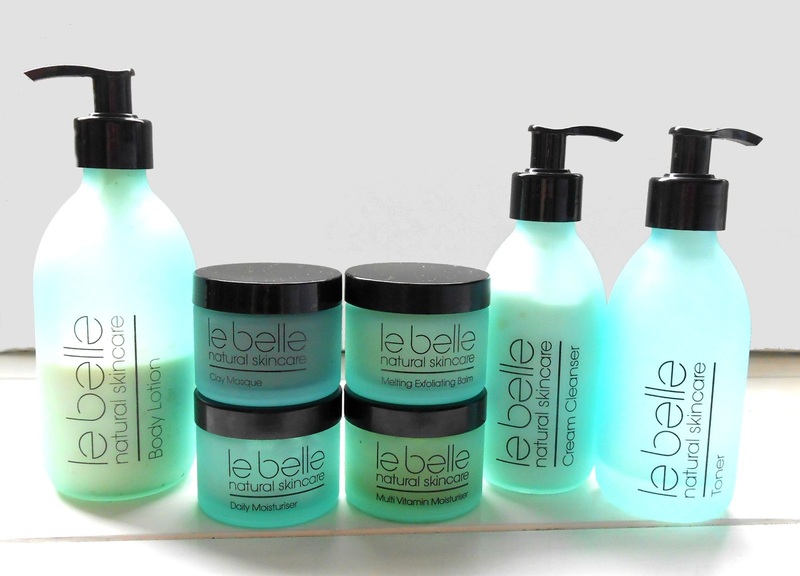 A little while ago I was blessed to receive a fabulous selection of natural skincare by the skincare brand ‘Le Belle’ based in the UK. Now I am someone that cannot go without my moisturiser, my toner and body lotions. After a shower or first thing in the morning they make me feel all ‘girlified’ (is there such a word? If not, there should be!). I love natural skincare, and I love supporting UK brands. I love any company that thinks about the world we live in and ‘Le Belle’ does. Instead of excessive packaging full of waste that ends up in landfill (or recycling if you’re lucky to have that in your area), Le Belle prides itself on using recycled glassware in its bottles, and as such the products are all in glass containers. I don’t know about you, but when I have products in glass containers they feel more luxurious and I know I can either refill them or re-use the glass again. And the reduction in waste means ‘Le Belle’ has been able to put that back into using only the finest high quality ingredients. They also source their ingredients from suppliers that are both ethical and Fair Trade. They only work with suppliers that follow sustainable working practices. What I love about ‘Le Belle’ is that once you have finished your favourite product you can get refills so you are not wasting the precious commodity of the glassware used and this is not thin glass; this is substantial frosted lovely glass (yes I am trying to review the product but I get carried away with the details – grin!). So yes, ‘Le Belle’ has a refill system. I love this idea! As I began reviewing a little while ago on my blog, I am afraid to say I have little left of the moisturisers because they are so very sumptuous on my skin. This is not a bad thing. As someone who has rosacea, I need natural and soothing skincare. So the first products I tried were the Anti-Ageing Daily Moisturiser and the Multi-Vitamin Moisturiser with Hyaluronic Acid Q10 both with 99% pure plant ingredients or plant-based ingredients. The daily moisturiser is really gentle on my skin and does not leave a greasy residue. It absorbs easily and as my skin can sometimes be greasy and sometimes incredibly dry (this must be the rosacea) I found this gave a great overall balance for daily use. As I often like to moisturise and go, I found this moisturiser was perfect under my mineral make-up and did not go cakey as it had absorbed into my skin easily. It has a light scent but not overpowering. It contains lupine flower extract, spilanthes acmella flower, rosehip seed oil, primrose oil and vitamin E. All perfect for invigorating the skin. The vitamin E and oils help with damaged skin which rosacea skin can often feel like. The Multi-Vitamin Moisturiser with Hyaluronic Acid Q10 is a gorgeous butter-lemon colour. The appearance creates a feeling of richness and I was not disappointed. I.don’t use the Multi-Vitamin Moisturiser all the time. It is quite rich and feels great when you have dry skin. You can use it with normal skin but you would probably need less, but it does absorb well into the skin. On the days when I had a little too much sun and my cheeks were burning, this moisturiser nourished my skin greatly. The scent is beautiful and a little goes a long way. The dry patches on my face disappeared after a period of weeks using this moisturiser. I find during hormonal times of the month it is ideal. I sometimes use it in the evening when I feel the need for some night-time moisurising. It works a dream as my skin feels brighter and fresh upon waking the next day. Hyaluronic Acid, Co-enzyme Q10, Sea Buckthorn oil, Rosehip seed oil, peach kernel, evening primrose oil and vitamin E.
All these ingredients promote skin regeneration, prevent the skin from dehydrating, and the vitamin E can stimulate cell growth. Now I readily admit I hardly ever use face masks. I have in the past (non-natural) and found them incredibly drying and a real pain to remove from the skin. I always wanted to try again so was pleasantly surprised at the Le Belle mask. The Clay Masque with Papaya with 99% natural ingredients first of all smells heavenly! I like to sometimes just open the jar and smell it. This mask is not too heavy and did not feel drying on my skin. After cleansing I applied it to my face (avoiding eyes and mouth) and left it on for the 10 minutes recommended. I felt like I was in some tropical country having a really amazing spa session. And the removal was far easier than other masks I have applied. I used a cloth with warm water and like most masks it took me a little while to remove but I did not rub hard which with other masks I had to do (not good for tender skin). Once removed, my skin felt amazing (and writing this review is making me think tonight is the night to do it again – it has been a while and we girls need to pamper don’t we?). Vitamins and minerals,papaya fruit, palmarosa oil ,fine French clay and Dead Sea mud. Good enough to eat – but don’t! The Melting Exfoliating Balm (100% plant based ingredients). This again smells divine. But alas until my rosacea has cleared I find any kind of exfoliating cream or balm (even those that are super gentle like this one) make my cheeks red and sore. But if I had dry, combination, oily or normal skin this would be perfect. And I am holding onto it with the hope that once I give up grains, my skin will be less irritated and I can try this again. But out of all exfoliaters I have tried in the past, this has been the most gentle on my skin. Sweet almond oil, cocoa seed butter, fine bamboo particles (said to be less harsh than uneven grains made from salt and nuts, making it safe and less irritating to the skin). Eucalyptus, peppermint and grapefruit oils restore and purify the skin.So thumbs up for everyone who is able to use this and hopefully me in the future. Now onto my absolutely favourite product so far and it is not what you would expect my favourite ‘Le Belle’ product to be. I absolutely adore the Natural Skincare Toner. To me it smells of almonds, but I have been told no almonds are in there so I think my nose is playing tricks on me. That aside it is a fantastic toner. Firstly, it is alcohol free. When I was younger, I used toners containing alcohol and they simply dried my skin out and did not smell very nice. It is beautifully gentle and great for removing make-up and toning up my skin. It is also hydrating which really helps support my skin unlike my toners of the past. My second favourite body product is the exotic vanilla body lotion. It comes in a large glass bottle with a pump spray and you can really smell the gorgeous combination of vanilla, ylang ylang, sweet orange, lemon and bergamot. I love using this after a shower and probably overdo it in the summer but needs must! I like to smell good. This lotion is not heavy and absorbs rapidly into the skin. To prove this to myself I just applied some to the palms of my hands and I am touch-typing away here. No reside on the keyboard just yummy smelling hands. Made from 99% plant-based ingredients in a 300ml bottle. Avocado oil, thistle oil, sesame seed oil, shea butter and vitamin E, and these are blended together with the exotic oils of Vanilla Pod, Ylang Ylang, Sweet Orange, Lemon and Bergamot. So you can imagine how feminine this body lotion is. A perfect holiday lotion for after the beach, shower and ready for dining out in the evening. It is very hydrating considering it absorbs so well but I get really dry legs in the summer and I forget about them in the winter so come spring-time my legs need a whole lot of nourishment. And lastly the ‘Le Belle’ Cream Cleanser. I have to admit I am a lazy cleanser. I like something simple and easy and most of all gentle on my skin. With 99% plant-based ingredients I find this does the job brilliantly. The application process is simple and my make-up is removed swiftly. What I like the most about this cleanser is that it moisturises too. I was once told at a facial I went to that my skin was like a sponge. I have incredibly large pores and no matter what she did my skin soaked it up. So I need products that do not strip my skin of its natural oils but merely support my skin’s balance. I like that I can use a warm face cloth to remove the cream as with other cleansers it involved warming the face, wetting the face, applying cleanser and then more cleansing and by the end I was exhausted. I love good skincare but when it comes to removing make-up and cleansing I want it easy and pretty darn efficient and this does just that. Overall ‘Le Belle’ ticks all the boxes in terms of ethics and caring for the planet but also takes care of my womanly needs to be pampered. I did receive the rose face serum and eye serum in my prize package but unfortunately upon opening them they had a rather strong off smell. So I think I had a bad batch and as it was a prize I didn’t have the heart to contact the company to tell them. So hopefully I can try those again some day. If I have wetted your beauty appetite for ‘Le Belle’ check out their website HERE where they have other ranges too that I have not yet tried including an oil cleanser, body polish, travel size products, try me kits and refill systems. Disclaimer: This is NOT a sponsored post. I won these products through a randomly chosen competition. I am choosing to review them as they are simply gorgeous products! Thank you, it is my first beauty review, I was a bit hesitant stepping into the realm of the beauty bloggers but my blog is pretty expansive and growing and changing, so I am just going with it.